Any distinction between "extremists" and "moderates" in Iran's political establishment is false. Whatever the results of the upcoming Iranian elections, there will be no shift in Tehran's human rights violations or core aims of regional hegemony and pursuit of nuclear weapons. What does matter is the behavior of the West, particularly the United States, in the near future. If it again resorts to cooperating with Iranian-backed forces in Iraq and Syria, Khamenei will not only be able to pursue his regional and global interests unfettered, but will be better equipped to contain crises at home. The presidential elections in Iran, scheduled for May 19, have observers wondering whether the "white turban" incumbent, Hassan Rouhani, will retain his position, or be defeated by his likely contender, the "black turban" mullah, Ebrahim Raisi, known for his key role in the 1988 massacre of more than 30,000 political prisoners. 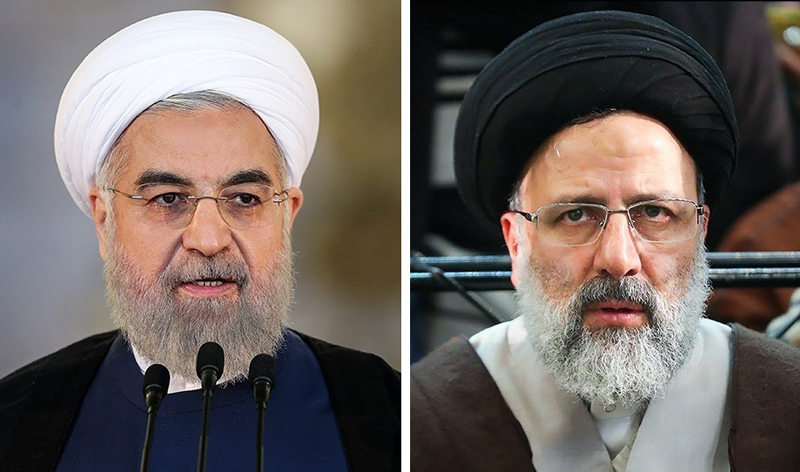 Iran's elections have observers wondering whether the "white turban" incumbent, Hassan Rouhani (left), will retain his position or be defeated by his likely contender, Ebrahim Raisi (right), the "black turban" mullah. (Images source: Wikimedia Commons). The two periods in Iran's recent history that need to be examined in order to answer this question are that of the tenure of former firebrand President Mahmoud Ahmadinejad (2005 to 2013), who also announced he is running again, and the one that has followed under Rouhani. At the outset of the Ahmadinejad era, Iran's GDP (using purchasing power parity) soared beyond $1 trillion, and two of the country's greatest threats -- Iraq under Saddam Hussein and Afghanistan under the Taliban -- were eliminated. Both enabled Iranian Supreme Leader Ali Khamenei to solidify his stronghold. Midway through this period, however, Iran's economy fell sharply. Iran became the country with the fifth highest inflation rate in the world. Iran fell into a serious recession, and millions of Iranians found themselves unemployed. All this was going on even before the international community imposed sanctions on the regime in Tehran. In the years that followed Ahmadinejad's replacement by the so-called "moderate" Rouhani, sanctions were lifted; oil exports reached pre-sanction levels; billions of dollars' worth of assets abroad were unfrozen; and hundreds of agreements were signed to expand business transactions with the West. Nevertheless, the last year of Rouhani's first term was characterized by yet another economic crisis, summarized in March by Iranian Road and Construction Minister Abbas Akhoondi as: banks going bankrupt, crippling national debt and low economic efficiency. Iran's economic crises mirrored its political ones. Despite a series of measures that the West imagined would usher in a new era, the opposite happened. Indeed, although Iran signed the Joint Comprehensive Plan of Action (JCPOA) with world powers in July 2015 -- and then-U.S. President Barack Obama persisted in attempts at easing tensions -- the regime in Tehran, exceeding its own 30-year record, outdid itself in fundamentalist activities. More than 3,000 executions of Iranians, for "crimes" such as "insulting Islam," have taken place under Rouhani; Iran got involved in three Middle East wars -- in Syria, Iraq and Yemen; and the regime's semi-official Mehr news agency said that the Rouhani government has done more to advance strategic weapons development recently than in the past decade. All of the above indicates that any distinction between "extremists" and "moderates" in Iran's political establishment is false. As former U.S. Secretary of State Henry Kissinger famously put it: "An Iranian moderate is one who has run out of ammunition." This is still true, which means that whatever the results of the upcoming Iranian elections, there will be no shift in Tehran's human rights violations or core aims of regional hegemony and pursuit of nuclear weapons. In the event of a Rouhani victory, the country's economy will remain crippled as factional disputes continue and divisions widen. If Raisi becomes president, Khamenei and the Islamic Revolutionary Guards Corps(IRGC) will tighten their grip on the economy, thereby causing an even greater depression as they allocate the bulk of the country's coffers to fuel regional wars and fund global terrorism. As the late leader of the Communist Party of China, Deng Xiaoping, said during a speech in 1962: "It doesn't matter whether the cat is black or white, as long as it catches mice." In today's Iran, it does not matter whether the president's turban is black (signifying its wearer is a descendant of the Prophet Mohammed through one of the 12 imams of Twelver Shi'ism) or white (meaning its wearer is not a descendant of the Prophet and is of non-Arab origin), as long as he remains loyal to the theocracy. If, on the other hand, the U.S. adopts a policy of ending Tehran's Middle East meddling (as its missile strike a Syrian regime airbase on April 6 indicates it might), the Islamic Republic's domestic powder keg could explode, spelling disaster for the mullah-led regime, no matter which candidate wins the presidency. The Iranian regime thrives on chaos because it has zero popular support at home and the only other option for it to sustain itself would be to stir unrest in the region. The single viable option to stop it would be to remove it from the neighboring countries and push it as far back as behind the Iranian borders as possible; something which should have been done a long time ago. 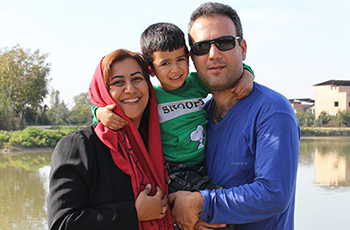 The IRGC should not be allowed to roam around and wreak havoc. What a depressing account of a people who have created the impression that they wish to live in peace - anywhere. I found it strange that the warring factions were described as "Palestinian", Arab, and Lebanese. The former is not a nationality. Still, for the purpose of clarity, perhaps the appellation was necessary. Considering said "Palestinians" - what, on God's green earth will ever satisfy them? King Abdullah of Jordan opened his doors to these Arabs in the seventies, and they expressed their gratitude by attempting to overthrow his government and depose him. The Lebanese government did likewise, and provided openhanded efforts, and aid to their incoming Arab escapees from their ill fated attack on Jordan, and ultimately had their generosity rewarded with bombs, bullets, and slaughter of its Christian population - among others. Perhaps, fellow Arabs in Arab countries have a better grasp of what this warring, troublesome people represent. They cannot live in peace with anyone - and as demonstrated, cannot even with each other. Could someone, anyone, please straighten me out and explain why ALL Muslims are taught from the same Quran, Hadith & Sharia, and a large number of those Muslims want me dead and a few, really could not care less about me as an infidel. So, why do we have such extreme outcomes? It's doing the same thing over again and again and having different outcomes. What goes?